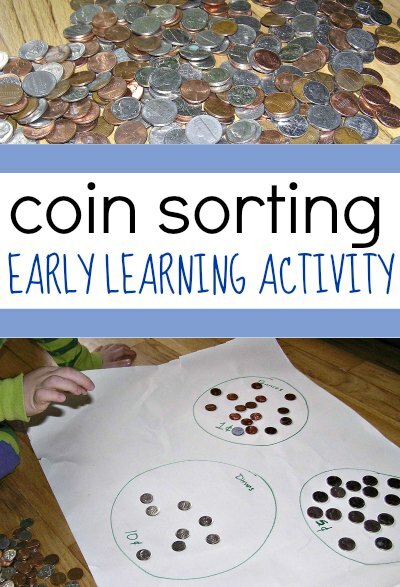 Sorting coins is a great money activity to to keep your kids entertained! It’s so simple and an easy early learning activity. There are two ways to do this: no-prep and low-prep. Take your pick. The no-prep way: Dump out all your change on the table (or on the floor, like I did) and have kids sort it. There are even various ways to sort coins! By coin value. Pennies, dimes, etc. By coin size. Line them up according to size. By color. Pennies in one pile, everything else in another. By picture. Show your kids the way not all nickels and quarters have the same picture on the back. If you have a lot of quarters, expect a lot of little piles! By country. If you are a world travelers with a lot of foreign change, add some into the mix! By year. Kiddo LOVED this way of sorting coins! Depending on how hands-on you want to be you can turn the coin sorting activity into a discussion about coin values, or even include a little free-style math practice if your kids are old enough. For example, show them how 1 nickel + 1 nickel = 1 dime. Personally, I love the moments of peace which come when my kids are engaged in a solo activity! We’ve been focusing on money this week too. Basically recognizing the different coins and their money value. I placed red price tags around the house on various things and gave her a handful of coins to make “purchases”. Oh, that is wonderful!! I have been wanting to do to this similar activity. Isn’t interesting it is almost always something we haven’t really thought of the kids comes up and find it more fascinating? wow. he is such a math rock star!